I am sat here watching my little man. My little man who has suddenly become a very grown up two year old. 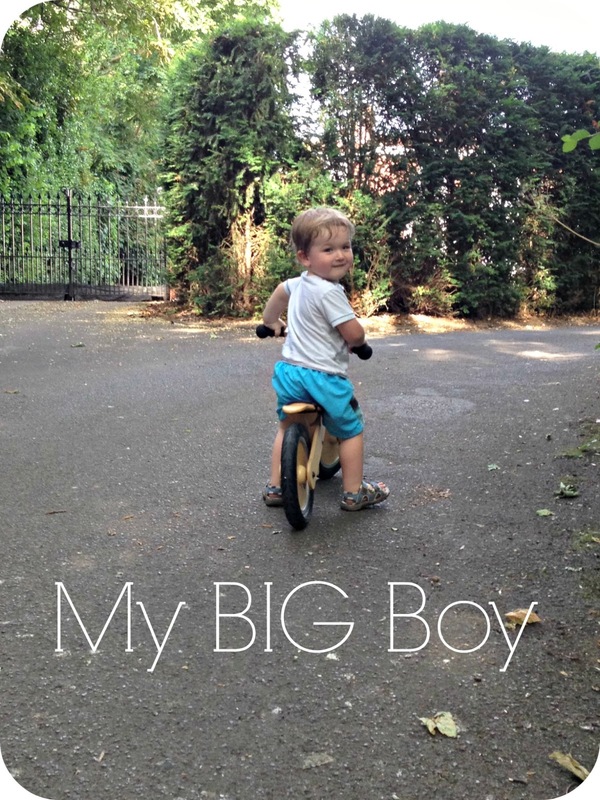 A little boy who now whizzes circles around me on his very first bike. 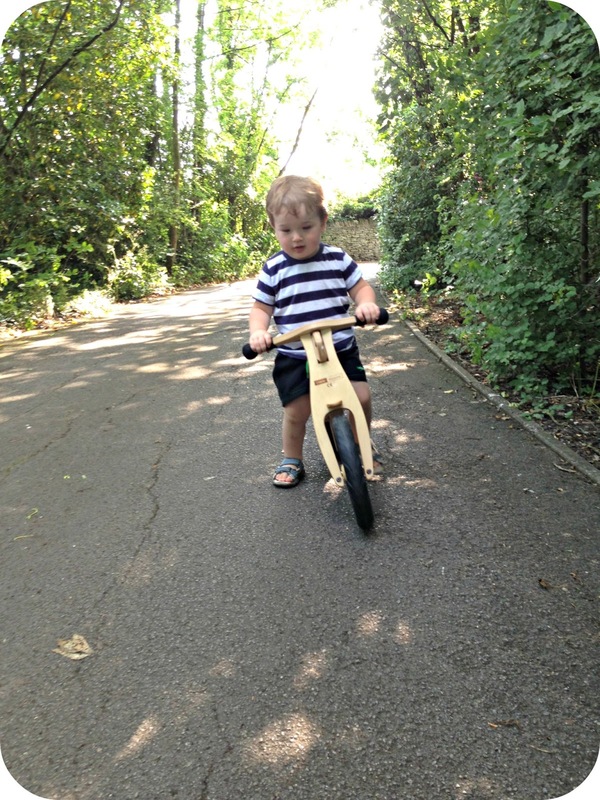 This is the Lloyds Worcester Jakayaan Balance Bike, and it is the perfect first bike for toddlers aged 2 and up. This bike is extra special as Lloyds Worcester are actually a local company for me. They are a small family run business based in Worcestershire and their main aim is to provide top quality products at realistic prices. 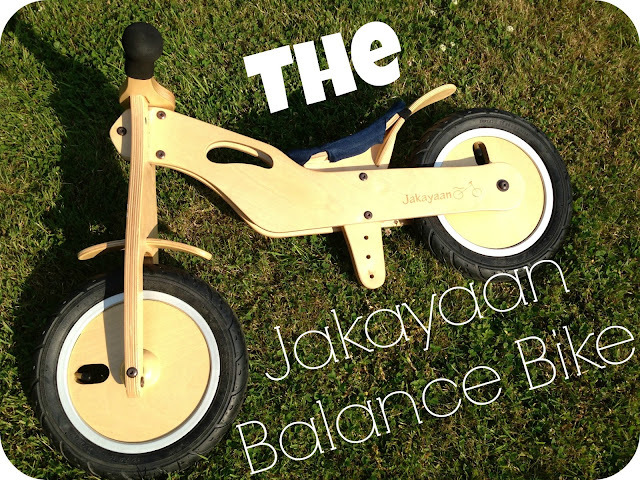 The Jakayan Balance Bike is constructed out of solid Birch Plywood which gives the structure of the bike a lovely solid feel, but at the same time keeps it light enough for a toddler to maneuver and handle all by himself. Leo has been completely smitten with his new bike since it’s arrival just over a month ago, he has taken every single opportunity to get outside and go up and down Granny’s long winding drive. Over the weeks I have seen how Leo handles the bike improve dramatically, and now he is exceptionally confident in getting on and off, turning the bike around at the top and bottom of the drive and is even picking up a bit of speed on the small slope! Max at Lloyds Worcester Ltd has very kindly sent the Jakayaan Balance Bike over for Leo to try out, he even put it together for us and personally dropped it off so that it was all ready for Leo to find when we got back to Granny’s. As I personally haven’t put it together I cannot tell you exactly how long it takes to assemble or whether it is a complicated process, but the end result is sure to get the same level of hype from your little ones as it did from Leo. If you do struggle putting it together or just want to see how it is done, Lloyds Worcester do have a great guide on how to get it up and running. Having watched the video on how to assemble the bike I can see that it is very straightforward, and it won't be long before your little one is whizzing circles around you too. As soon as Leo saw his new set of wheels he was up and gone. On that first evening we were outside over an hour as he rode up and down the drive. Leo sat on the seat walking the bike along, he looked so incredibly proud of himself while he followed his young Auntie along on her electric scooter. I think this is one of the reasons that the Jakayaan Balance Bike has been such a big hit with Leo, he can get out and play with the big kids. He can try his luck in keeping up with them, and when he is on it everyone watches him…Boy does my little guy love an audience. In recent weeks Leo has become so much more confident in how he rides his bike, I have noticed him picking up more speed as he pushes himself around. Leo can push himself up the bump on the drive and even back down again (he loves the speed he picks up as he goes). The bike doesn't have pedals or brakes and it is for this reason that it is perfect for younger children, Leo uses his feet to start moving and also stop. He has had no issues at all in getting used to riding his bike, and I think it is such a great way for him to learn all about balancing himself as he learns to ride a bike. The fact that the balance bike has no pedals makes it perfect for Leo who is just learning how to get around on it. I don’t have to worry about Leo getting any clothes caught up in a bike chain and he doesn't have to worry about learning to pedal just yet. The Jakayaan bike is giving Leo a chance to find his feet and his balance, in the not so distant future I can see Leo zooming down the drive with his feet firmly off the ground as he balances the bike to go exactly where he wants. In fleeting moments where Leo has got off the bike, I have stolen the chance to have a proper look at the Jakayaan Balance Bike for myself. 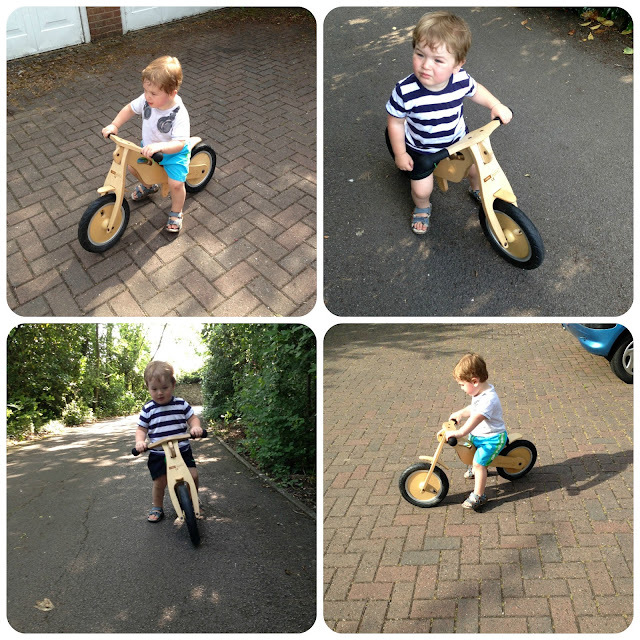 The pneumatic wheels that support the bike are great over bumps and slopes…As Leo has discovered. The handles are covered in foam for those ‘accidental falls’ that take place every once in a while when he loses his balance and tilts one way or another. The handle bar has been designed so that there is a limited amount of steering, this prevents Leo from turning the front wheel to far around and coming off. The front forks of the bike have been angled in such a way that it helps the bike (and the rider) to keep going straight, Leo turns the bike himself by standing up and turning the bike in the direction he wishes to go, before sitting back down and jetting off again. 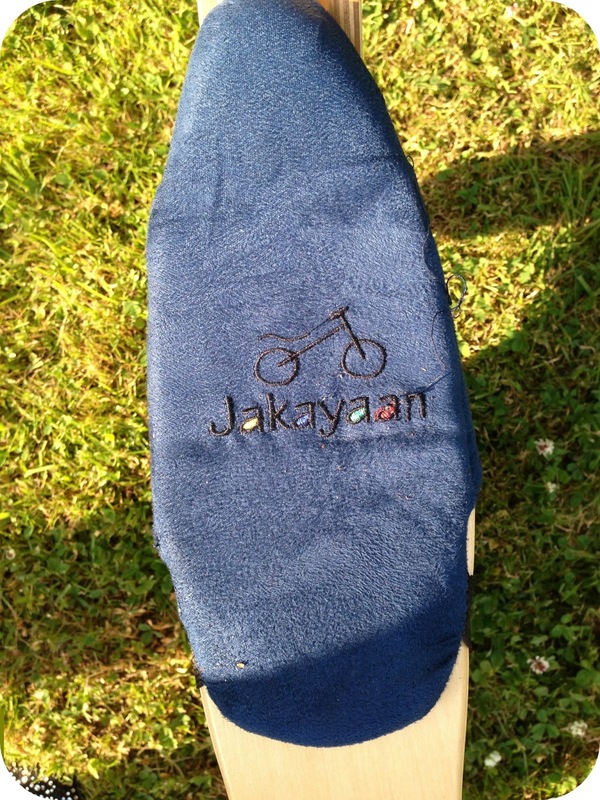 The Jakayaan logo is hot stamped onto the side of the bike, and looks far more swanky than any sticker ever would. The logo is not going to become tatty over time, and the whole bike still looks as shiny as the day it first arrived, and it has certainly been put through it's paces over the last month. One day when Leo has outgrown this bike, I will be putting it safely away for any future children I go on to have. It is one of those classic toys that can be passed down through the generations and can be enjoyed time and time again. I have often raved about my love for solid wooden toys that stand the test of time, and this bike is one of those toys. There is a choice of two seat covers in the box, one Pink and one Blue each embroided with the Jakayaan motif. The seat cover choice is great if you are buying the balance bike as a joint present for a brother and sister, that way there really is no arguing over the colour preference. I know this is something that my brother and I could have done with back in the day... Leo is currently sporting the Blue cover but if he does fancy a bit of a change, the Pink one is always on hand to do so. The seat of the bike can be adjusted to suit your child very simply and this is is again shown in the assembly video. There are four levels to use so that you can get the very most out of your Jakayaan Bike. I can see that this balance bike is going to last Leo a long time and will see him through until he is ready for a bigger bike with pedals and brakes! The balance bike will be helping Leo in preparation for the next stage of bike and is going to really help the transition in ‘learning to ride a bike’, who knows he may even skip the stabilisers stage if he nails his balance on his Jakayaan! So how much does a Jakayaan Balance Bike cost? Now this may surprise you. Are you sitting down? The Jakayaan Balance Bike costs just £52.99. That is a whole lot of bike for your money! The quality and detail that has gone into this very popular bike makes it worth every single penny. I would highly recommend this bike for any of you with second birthday presents to buy soon as Leo was absolutely over the moon to see this bike. The price of £52.99 is inclusive of delivery to mainland United Kingdom (excludes Scottish Highlands and islands), but for those of you further afield who are interested in a Jakayaan balance Bike you can visit the website Jakayaan website. You can keep up to date with all that is Jakayaan over on their Twitter Page and of course their Facebook Page. Make sure you say hello as they are such a lovely team and always happy to answer any of your questions. Of course if you have any questions about the balance bike, I am more than happy to try and answer them for you. I will leave you with a short video of Leo enjoying his time on the bike, there are snippets from the very first day right through to now. You can see how he has come along, how his confidence levels have risen and just how much fun he has been having! 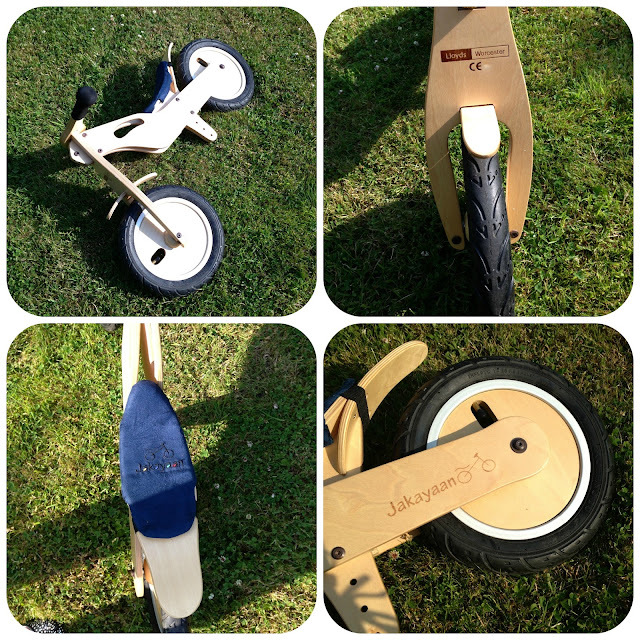 How would you like the chance to win a Jakayaan Balance Bike of your very own? I have one to give away to one very lucky reader. All you have to do is follow the Rafflecopter entry methods below. The giveaway ends on the 17th August 2013 and is open to the whole of UK Mainland. 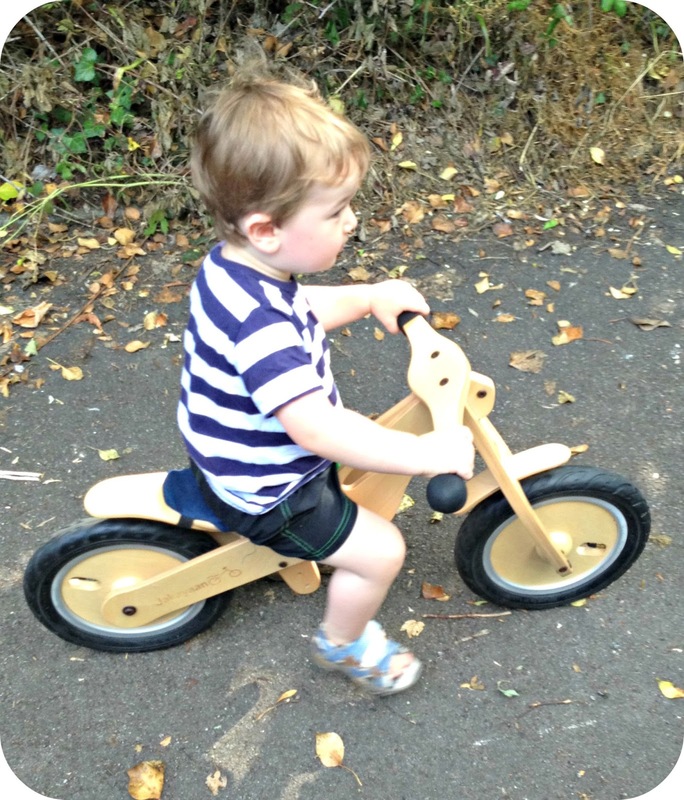 Disclaimer: I was provided with the Lloyds Worcester Jakayaan Balance Bike for the purpose of this review. All opinions expressed are my own personal experiences with this bike and all photos/videos are my own.